(1) Use the diagram to sketch two similar quadrilaterals in your notes. 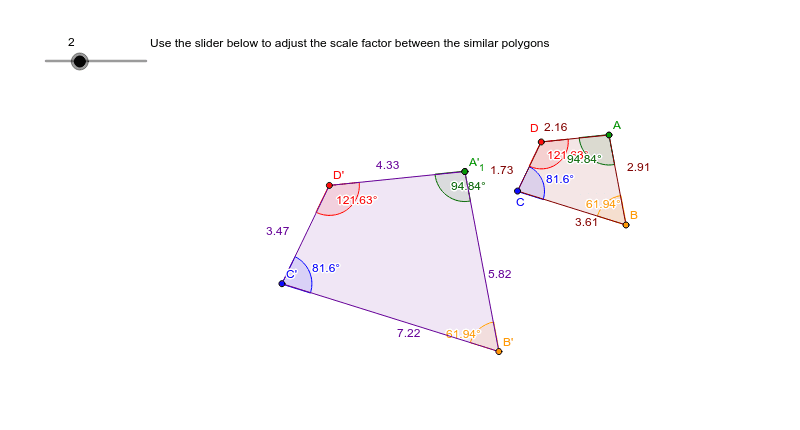 (2) Give the scale factor that you chose (using the slider - CHANGE IT) between your polygons. (3) Label the angle measures of the corresponding angles of your polygons. (4) Find the ratio of each pair of corresponding sides. Use a calculator to get decimal answers. (5) Write a ratio comparing the perimeter of the polygon on the right to the perimeter of the polygon on the left. (***YOU MUST CALCULATE EACH PERIMETER BY ADDING ALL 4 SIDES) Use a calculator to simplify this ratio. What did you notice?